This Cantonese Egg Tart is a very traditional Chinese dessert that you'll find in many Hong Kong restaurants (茶餐廳 Cha Chaan Teng). I baked some egg tarts and brought them to a family gathering a few weeks ago. Afterwards, I posted the recipe in Chinese here. This morning I received a message urging me to translate it into English. Just insert a toothpick into the custard. If it stands on its own, it’s done. Here it is. Hope every fan of Egg Tarts will enjoy! Place butter at room temperature until softened. Cream the butter and sugar with an electric mixer over medium speed until the mixture is smooth, fluffy and light in color. Add in whisked egg, half at a time, beat over low speed. Add vanilla extract, mix well. Roll out the dough to a 1/2 cm thickness. Cut dough with a cookie cutter that is just a bit smaller than your tart tin in size. Line dough in the middle of tart tins, one by one. Lightly press the dough with your thumbs, starting from the bottom then up to the sides. 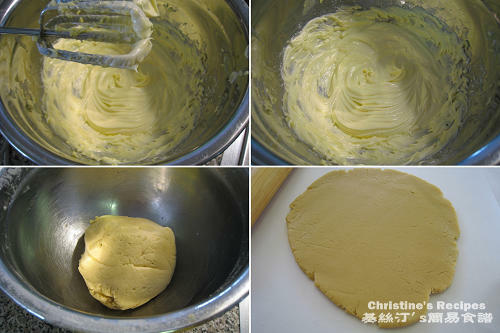 While pressing the dough, turn the tart tin clockwise/anti-clockwise in order to make an even tart shell. Trim away any excess dough. Add sugar into hot water, mix until completely dissolved. Whisk egg with evaporated milk. Pour in sugar water. Mix well. Sift egg mixture to get rid of any foam into a tea pot. Carefully pour egg mixture into each tart shell. Preheat oven to 200C. Position rack in lower third of oven. Bake tarts for 10 to 15 minutes until the edges are lightly brown. Lower the heat to 180C. Keep an eye on them. Once you see the custard being puffed up a bit, pull the oven door open about 2 to 3 inches. Bake for another 10 to 15 minutes until the custard is cooked through. Just insert a toothpick into the custard. If it stands on its own, it’s done. At the very last stage, pull the oven door open a few inches. This method is to avoid custard from being puffed up too high. The custard would collapse once they are cooled down otherwise. Ok, if I try it, I'll post and share with you guys. Also where did u get your moulds from???? I bought them from Hong Kong. There are many shops selling bakery things in Shaighai Street. I've been all around Brisbane and can't find what I would call 'ideal' tart moulds. I'll remember to grab some overseas next time. Great tasting recipe by the way, great info! Neither could I find any of this kind of cup cake moulds in Brisbane. What a shame. So, I bought some from Hong Kong when I went for holidays there. But I tried to use some ramekins, lined with baking paper instead, the results were good. The cakes looked a bit shorter though. The taste were no difference. those look wonderful! i have to try them. i have been looking for a recipe for these FOREVER. What is caster sugar? Can I find them in the US? Caster sugar (or spell in castor sugar) is super fine sugar, a lot smaller crystals than regular sugar. It’s commonly used to cream butter for making a cake. It dissolves instantly in liquid. So this recipe calls for it. In US, it could be just called superfine sugar. If you can't find any at your nearby supermarket, you can turn regular sugar into caster sugar using a processor. Just process the sugar for a few minutes into very fine crystals. Thanks Christine these look wonderful, I'll give them a try. Do you also have a recipe for Portuguese Tart? Sorry, I don't have a recipe for Portuguese Tart at the moment. Wow the tarts look heavenly. I will have to try the recipe, thanks for sharing it! You've got a great site! Hi, tarts look delcicious. I'm wondering what you could swap the evaporated milk with? Sweetened and condensed milk? Just milk? Whipping cream? Thanks for your kind words. The tarts are really yummy, don't miss it. I haven't tried to swap the evaporated milk with anything yet because I love it as it is. I just tried your recipe and the tarts turned out amazing!! Everybody loved it! It reminded them of the egg tarts from HK. Yay, you baked the tarts that became a big hit. Thanks for letting me know you liked this recipe. Really encouraging! I just made the tart, it didn't turn out as presentable as yours, but it taste really great! I am thinking of making this for my next dinner party! Enjoy your great dinner party! These are perfect! Best egg tarts I have ever seen....and believe me....so much better than those sell in 4-stars hotels restaurants! The best part of baking egg tarts at home is that you can always taste the fresh and hot tarts right at the moment they come out from the oven. It's incredibly yummy. at the lat stage do you mean bae the egg tars withthe oven door open? That's right. Continue to bake the egg tarts with the oven door open a few inches at the very last stage. Keep an eye on them and don't let the custards puff up too high. I made the egg tarts yesterday and my husband loves it! he said its even better than those i bought in Chinatown. thanks christine, u have a very interesting website. i enjoy it. umm..just to make sure "gm" is grams right? Oh, I'm really glad for you. Thanks for letting me know your husband's comments. Actually, I bet you're very skillful in baking too. Welcome you to come back for more. I'll share what we like to cook and eat. the filling is awesome but i think the crust needs to be flakier... i will def. use the filling recipe again but might look for a different crust. THANKS!!! The flakier crust is yummy too. The custard would go very well with it. icing sugar is powdered sugar? am i wrong? You're right. Icing sugar is finely grated as powder. The recipe calls for icing sugar because it dissolves easily and quickly. Hello I was wondering if I could freeze these? Sure, you can freeze them if you like. You might like to reheat them in your oven before eating them though. Egg tarts are more delicious when they're still warm, you know. Congrats! You've made beautiful egg tarts in the second trial. I saw your pics on your blog. Very beautiful. I just made these, and couldn't resist having one out of the oven--and almost burnt the top of my mouth! Thanks for the recipe! I couldn't believe how easy it was! That's great. You can always enjoy eating yummy egg tarts that come out hot from oven. Sure, you can use margarine if you don't mind tasting a bit dull. do you have a recipe for the flake puff crust酥皮? Hi Christine, thanks a lot for this wonderful recipe which i tried yesterday. do you think i can substitute the evaporated milk for coconut milk? I just baked some egg tarts! Wow! Your recipe is awesome. This is my 1st attempt. I have been craving for egg tarts for years, but never attempt to make. Btw, your Waffles also awesome. Easy and tasty! Good on you! Succeed at the first attempt. Egg tarts and waffles are my family's favourite desserts. We've got the same taste so to speak. We also have the same story line. I'm also a M'sian residing in The Netherlands. Great minds think alike. --> Great foods share everywhere. Have just made these, and they taste fab! Thanks very much for sharing. My husband will be coming back after the weekend and I can't wait for him to try these! 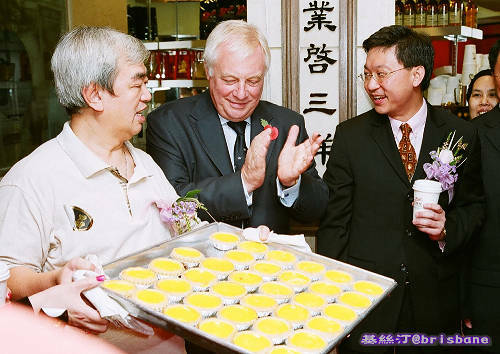 Hope your husband will like your egg tarts too. I'm a complete amateur when it comes to cooking, I would really like to attempt this recipe but I'm struggling with measurement conversion. I'm living in Australia, so I don't know if the culiverter on your blog applies because the measurement system may be different. and 85 gm evaporated milk? I know this is a big request, but I would be so thankful if you could help me. Thanks. Do you have a weight/electrical weight? Since the mass of every ingredient is different, you can't get all these 5 different ingredients from one converter. Google different ingredients to convert what you want. For example, the weight of plain flour is 125 grams per 1 cup according to this converter here. So 225 grams = 1.8 cup. Even though you don't mind spending too much time on searching and calculating, it could be some mistakes somehow. So, using an electrical weight is the best way. haha ok, thanks for the tips. I will start shopping for an electronic kitchen scale soon. Sorry this may be a silly question, just wondering do I pour the whisked egg and evaporated milk into sugar water when the sugar water has cooled to room temperature or when it is still hot? No question is silly. You're welcome. The hot water is to help dissolve sugar easily and completely. Wait until sugar water has cooled down, then add whisked egg and evaporated milk. this recipe is TERRIFIC!!! I (from Germany) have been looking for such an egg tart recipe all the time. I replaced the evaporated milk with fresh milk and it worked out perfectly fine! Thanks so much for this great recipe! hello my oven is like yours and the oven turns on the bottom heater when i put in bake mode but the top heater is off. Should i still put it in the middle rack or lower rack? So glad to hear that my recipe worked out perfectly for you. Thanks for letting me know. You need both top and bottom heater on when baking this egg tart. Put them in lower rack because you want to make sure the tart base being cooked through quickly before the custard puffs up. I can remember my mother baking egg tarts. She used ti put in eggs, sugar,vinigar and a pinch of salt. After they were baked they araised crust over the top, the center was a little runny. I CANNOT get this "crudt " on top of my tarts. What am I doing wrong? I can remember my Mother baking egg tarts. She used to put in eggs,sugar, vinigar and a pinch of salt. After they were baked they had a raised crust on top, the center was a little runnu. I 'cannot ' get this crust on topof my tarts. What am I doing wrong ? It is ok if I replace the plain flour with cake flour? If yes, then should I increase the amount or still use 225g? Thanks. I've tried twice so far. The first time with the crust recipe that you've provided here and the second time with pre-made tart shells. Both were just great as the ones my mother makes. i just tried this recipe twice,followed to the T, but somehow, the crust "dough" is not in a dough form, and I always had to add extra more flour for it to become dough-like, which made the crust tasteless and less buttery. Wonder what made it like that? but the custard is really nice! I've tested the recipe with success at the first time. And my friend also made her family these egg tarts with satisfaction. The ingredients of making dough in this recipe are all right. Don't add too much flour, otherwise spoil the texture. Just follow closely the recipe and the steps. Wow! I've been trying to find a great HK style egg tart recipe. Made it tonight and it tastes great! thanks! I cant wait to try your recipes. The pictures and directions look awesome! however, is it possible to put the ingredients in Teaspoon and Tablespoon measurements instead of Grams? I have to convert most of your recipes to those measures and im afraid it wont turn out right. I learned to bake these egg tarts from my friend. We didn't measure the ingredients in teaspoons or tablespoons. Sorry! If you're really serious about cooking, try to get a kitchen scale. It's not expensive though. 225 grams of hot water is stated in this recipe. You might decrease the amount of sugar to suit your taste. Hi christine~! thanks for this recipe! 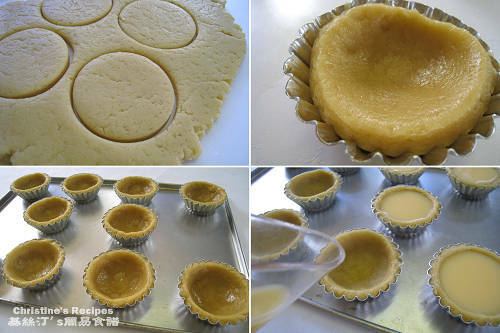 i've previously made these using muffin molds but I would really like to try them using egg tart molds (because my brother thought the muffin molded ones didn't look professional and refused to eat them! )but I couldn't find any in Sydney so now I'm in HK and I went to Shanghai St. but the shop I went to only had big tart molds so I was wondering if you could remember the name of the shop you went to? It's 二德惠. Click to have a look at their egg tart moulds. 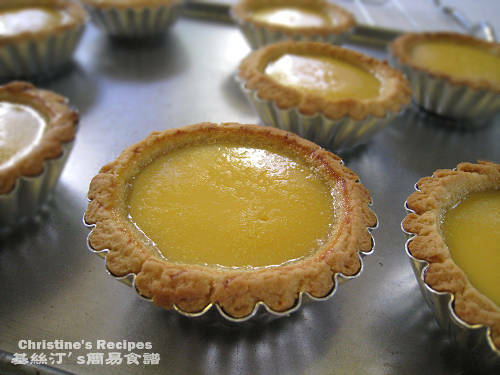 I have tried baking egg tarts using another receipe, the crust were far too flaky. We cant even hold it properly on our hand. What could be the problem here? I guess our fillings were overbaked as I allow the fillings to puff up to the max, thinking that it will jus be nice after it cools down. 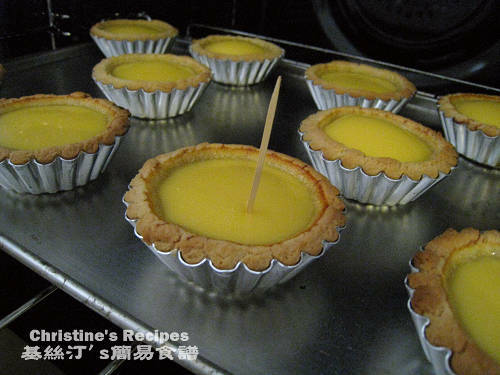 I have bakd the egg tarts but end up burning the custard filling on the edges. Should turn the heat down or more it to a lower shelf in the oven? Lovely egg tarts! For how long should they stay in the oven before I can tell they are exactly baked?! Or should I only dwell on how they smell! Thanks for the advice. The time of baking was explained in the recipe already, please refer to the part "Method (baking tarts)"
I just made these egg tarts using this very recipe and I am proud to say that I got interesting results! I made these egg tarts however my crust was very hard. What did I do wrong? I followed the recipe and baked for 10 mins at 200C and 10 mins at 180C with the door ajar. Please help! The timing and method of creaming the butter is very crucial. Did you place the butter in room temperature until softened? Once you cream the butter with sugar until fluffy and light in colour. Then it’s alright. No need to over beat it, otherwise the butter is melted, then you hardly have crisp crust. Sorry folks, I have to close the comment for this post is too long and it slows down the blog.